Choosing monthly web hosting could be a right option for webmasters and bloggers who care robust performance and customer support without sticking to annual contracts. But wait, it doesn’t mean annual plans don’t offer quality WordPress web hosting or technical support. Sometimes a company that works fine at the time of buying hosting later failed to maintain the same quality in the future. So, in that case, annual subscription cost you not only money but also revenue lost. For instance, in the month to month web hosting, you can cancel the service anytime as you don’t have to follow any contract. But with yearly based hosting, there is only 30 to 45 days money back guarantee option. Let’s say, you purchased hosting for one year, and after few months your website starts facing frequent downtimes or other performance issues like deadly slow loading time, etc. The refund time is gone and you’ve paid for the whole year in advance. That’s a total loss. However, there are few companies that offer pro-rated refund after the full refund period. Secondly, as monthly hosting billing give the freedom of anytime cancellation, but it cost more money per month along with a one-time setup fee than yearly subscription. Last but not least, usually you don’t get a FREE domain name with month-to-month hosting payments. The only advantage that I observed is you can leave the web host any time if they failed to fulfill the need of your site. Payment: Credit Card, PayPal, Skrill, 2CheckOut, Bank Wire Transfer, and Check/MO. A2 Hosting is a swift and superior monthly based web hosting provider with unlimited storage and unmetered bandwidth limit. You get web space on SSD to make your websites fast enough to load within few seconds probably 1~2 seconds. On top of that, configuring W3 Total Cache or any speed enhancement plugin can further improve the load time. Upper tier A2 Hosting plan also includes Turbo Server for 20x faster user experience along with A2 accelerator. So, how they achieved an incredible speed and 99.9% uptime guarantee? The simple answer is they don’t rush your server by sharing with hundreds of users. Usually, shared server populated with many users but A2 don’t do that, instead, they host fewer users per server but deliver more resources for each account to handle traffic spikes. Buying SSL certificate separately costs extra money, but A2 offer FREE SSL certificate for all accounts. Like many companies, they allow 30-day full money back guarantee with no question. The best thing is you can ask for the refund after 30 days because they also support pro-rated return. Regarding customer support, 24/7/365 guru support is always there to help you anytime via live chat, email, and phone call. And five-star rating by 4k+ third party reviews and A+ BBB rating may convince you to choose A2Hosting for unbeatable performance. FasComet offers the best hosting alongside month-to-month web hosting plans with a free domain at affordable rates. Chances are you might hear the name first time, but they deliver extraordinary services at low prices. Comparatively, FastComet is new in web industry than other companies listed here, but the team behind has more than seven years of experience in providing professional services to private and business clients. They have 7+ data centers, thousands of customers from 70+ countries around the globe. The best part is FastComet gives you a free domain name even for monthly based hosting subscription which is not common at all. However, they charge $19.95 setup fee to configure your account and most companies do the same for non-annual packages. Regarding server specs, you get fast web hosting on SSD servers powered by latest E5 processors, and massive 32 GB of RAM per node. They also partnered with CloudFlare, cPanel, Spam Experts, Intel, WP Rocket, Linode to name a few. The company doesn’t use dirty tactics to charge hidden fees, offer cheaper plans, backup your data on weekly and daily basis, and all accounts come with cPanel/WHM control panel for easy management as well as 24/7 server monitoring to prevent disasters. The “StartSmart” package includes a free domain for life, single website, 15 GB SSD storage, 2 GB RAM, 25000 visitors/mo, unmetered bandwidth, instant support, and of course FREE SSL. Still not sure if FastComet worth your money? No problem, they also have 45-days risk free money back guarantee. Green Geeks is the leading green energy consumer hosting provider that utilizes 300% renewable energy to contribute their part to reduce global environmental warming. In my research, they are the only host that entirely rely on wind power/renewable energy sources. The company has 9 years of industry experience (founded in 2008) and empowering 300k+ sites including 35k+ customers worldwide. The users having a low budget but cannot compromise on performance then feel free to choose them. GreenGeeks cares the user standard and that is why all of their data centers equipped with redundant power supply, routine data backups, and server monitoring for data protection. It also plays a vital role to deliver an incredible uptime of 99.9%. They implement the latest security patches and software updates as soon as possible for optimal performance. The most enticing thing is all server built with the branded latest generation Intel Xeon processors, Raid-10 SSD, Minimum 64 GB RAM, and Gigabit Connectivity. 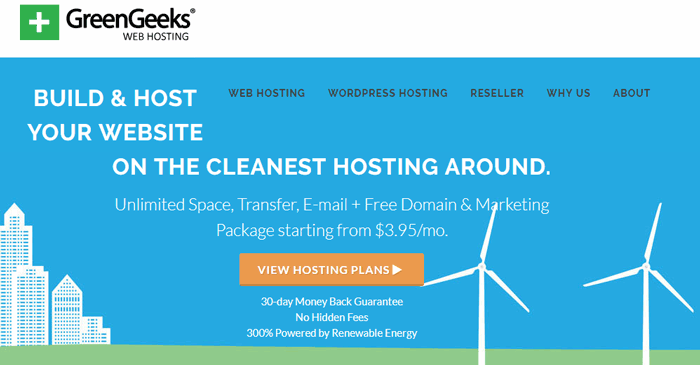 You can opt-in shared Green Geeks plan to pay monthly web hosting bills for unlimited SSD space & data transfer, website migration, free domain, WordPress optimized servers, one-click application installer, RAID-10 protection, and real-time security scanning. GreenGeeks offers only one plan for shared hosting and claims 99.9% uptime guarantee along with 24/7 US-based support through chat, call, and email. Your investment covered by 30-days money back guarantee as well. SiteGround is one of my favorite hosting services for exceptional performance and server uptime. They are also one of the recommended hosts by WordPress.org to create a WordPress blog and independent non EIG host. SiteGround deliver more features than the money you pay including free SSL certificate, regular backups, and free site transfer. Currently empowering more than 800k domain and sites under their administration and has earned massive respect due to outstanding quality. Besides high speed hosting and superior support, they secure all accounts via advanced CHROOT isolation technology which protects against hacking attacks. If one account got compromised, it doesn’t affect other users on the same server even in shared hosting. Furthermore, SiteGround was the only host that introduced CHROOT isolation in 2008 and still, they have sturdy security measures in the industry. Their pro-active monitoring system keeps an eye on all machines to deliver 99.99% or even 100% uptime in some months. All of their plans differentiated by monthly visitors, disk space, and allowed domains per account. SiteGround’s servers built with solid state drives (SSD) to store data which helps in rendering your website content and database fastly then mechanical drives. Plus, SG optimizer plugin and multi-layer cache mechanism dramatically improved the loading speed. You can also utilize free CloudFlare CDN to enhance monthly bandwidth by blocking bots/bad traffic. 24/7/365 customer support can be reached within just a few minutes (Max. 2 minutes) through live chat, phone, and ticket system. Note: No doubt, they are awesome in all ways except visitors and storage limitation. On monthly based hosting, SiteGround provides only one-month trial plan and at the time of renewal, you’ve to pay for the whole year rather than one month. It’s strange but true. Kinsta is a well-known name when it comes to high end fully managed WordPress hosting out there to get web hosting plans on the monthly and annual basis. The company was started in 2013 with the core aims of delivering speedy, scalable, and robust security for webmasters seeking managed WP storage built on cutting-edge technology. They have a team of experienced WordPress geeks who know how to deal with problems and fix them. Their advanced infrastructure optimized by utilizing LXD containers, MariaDB, PHP 7, and NGINX for blazingly fast site loading speed. They use Google cloud platform to store all of your data on premium class servers with automatic scalability feature. Futhermore, the robust security monitoring prevents DDoS attacks, ensure maximum uptime, scan for malware, and hardware firewall. SSL certificates support also included for all users. Talking about Kinsta prices, their rates are higher than other companies listed here. The “Starter” costs you $30/mo which includes single domain, 3 GB SSD storage, 50 GB CDN volume, and 20,000 traffic per month. You might say that web space looks insufficient but it’s suitable for small sites/blogs. One-click easy to install SSL certificate also included as well. Some advanced features are; staging, HHVM support, PHP 7, performance monitoring, premium DNS management, cloning, white-labeled plugin, 13 global locations, SSH access, and 1440 daily uptime checks. Advanced features vary from plan to plan such as cloning is available for all packages except the “Starter” one. Kinsta customer support consists of experts having over a decade of experience to solve WordPress issues within no time. Bloggers and Webmasters searching for excellent dedicated WP host should choose Kinsta. TMD Hosting was established back in 2007 and another monthly billed web host that also provides a free domain. They are working with many enormous names such as cPanel, CloudFlare, Spam Expert, Intel, and Softculous, etc. for sustainable and reliable storage solutions. TMD has 7 data centers located strategically around the globe for enhanced load speed. Plus, three layers of cache makes your webpage 16x faster for incredible browsing experience. You can choose from Linux and Windows plans – most hosts don’t support Windows OS or charge high fees but TMDHosting has affordable rates for Windows packages also. The major advantage with them is you can avail unlimited web space on solid-state drives with no monthly bandwidth limits and a free domain even with a month to month billing structure. Your server daily scanned with BitNinja Firewall for an extra layer of security against threats. It doesn’t end here; there is also no setup fee as well 🙂 So, you just have to pay only $8.95 per mo. for all features to create a blog on TMDHosting server. Usually, hosting services demands $15 to $20 for setup fee when subscribing monthly billed hosting. Isn’t it a $20 saving? Customer support is always there and just a few minutes away to get in touch via multiple channels including live chat, call, and ticket system. If they failed to make an impact, just ask for the return within 30 days (refund policy). Note: They offer 60 days money back guarantee for annual subscriptions only. Check out this TMDHosting review for more details. This one is the oldest company was founded in 1996 (registered in 1997) by undergraduate students Michael Rodriguez, Josh Jones, Dallas Bethune, and Sage Weil. It’s a Los Angeles based domain name registrar and web host. Now, handling more than 1.5 million websites, applications, developers stuff, WordPress blogs, and small business. They have over 400k+ satisfied customers all around the world from 100 different countries and growing. Isn’t these figures enough to choose their monthly web hosting? Just like SiteGround, they also store your content on SSD for 200% faster speed than traditional drives but there are no visitors as well as storage cap with DreamHost. You can host unlimited domain names and upload unlimited data along with no monthly bandwidth restrictions. They offer only one plan for shared server hosting which starts at $7.95/mo (saves 27% off) for three-year subscription and $10.95/mo on monthly based billing at zero setup fee including FREE SSL certificates. DreamHost is also an award-winning 24/7 customer support provider and assists you via live chat (fixed hours), email, and phone callback. However, you’ve to pay for callback service but email/ticket support also a good way to get in touch. As mentioned above, being an older player in the industry, they also offer the most extended money back guarantee of 97-days (annual subscription). You can guess how confident they are in the quality of service they deliver. Vultr basically is a cloud server hosting service and different from all the web hosts mentioned here. They don’t offer cPanel control panel to manage your account but all of their packages include a custom designed dashboard which is super easy to use. I already listed them as one of the cheapest cloud hosting service that offers high uptime along with lightning fast website loading speed. You can launch your server or instance as low as $2.50/mo with 20 GB SSD storage, 1 CPU, 500 GB bandwidth or pay as you go billing structure. They have two billing ways to avail any server; monthly or hourly billing. More precisely, Vultr is the right option for developers and designers to host their application for reliable and scalable infrastructure. You can easily upgrade server resources with zero downtime and don’t have to migrate site/application data from one machine to another. All of their servers built with solid state drives and available in 15 locations globally for eye blinking rendering. So, if you cannot afford expensive hosting plans and your primary goal is to install WordPress CMS to create a website, then choose Vultr. They offer one-click WordPress installer and pointing your domain name is also super easy. Regarding SSL, you can activate it by utilizing CloudFlare’s free account. It won’t take too much time to get online with them. But, if you’re a starter and don’t know the technical stuff, pick from other services mentioned in this list like A2Hosting. One flaw that I think may urge you to avoid them is lack of live chat and phone support. Yes, they don’t offer both channels to get instant assistance but can be reached via email/ticket system. Sometimes it can be irritating when you need urgent help due to the nature of the problem. But, the good news is they reply quite fastly and try their best to resolve the errors. HostWinds serving the customers since 2010 and Tulsa, Oklahoma based affordable web host that offers cheap month to month billing web hosting plans with an incredible 99.99% uptime. The company’s primary goal is to ensure customer satisfaction rather than just making profits only and to achieve this, they have the most reasonable plans as well as business-class customer support available 24/7. They have two data centers located geographically for load balancing to maintain the performance of your websites even under high traffic. You can buy cheap monthly web hosting boasting enterprise-grade servers specs and latest generation processors just at $6.69/mo to host a single domain. All plans allow unlimited disk space and bandwidth, unlimited MySQL databases, free dedicated IP address, free migration, and auto-installer by Softaculous. The main difference between packages is the allowed domain per account. However, you get unlimited storage for all. On top of that, they use SSD’s for 400% faster data rendering. Unlike many companies, HostWinds allocate fewer users per server to ensure robust performance by giving more resources. Handling traffic surges is not big with them as their ultra stable infrastructure built with scalability feature to maximize the system resources when needed. The company also take nightly backups and present superior technical support round the clock through live chat, phone, and tickets. HostWinds support is always ready to help you solve issues you might face which happens rarely. Additionally, 60 days refund policy also given to all users. MDDHosting is not a big name in web industry but they serve affordable and quite reliable website hosting that can be purchased based on annually/monthly. It is a privately owned non EIG web host operating independently since 2007. Though they are not as big as SiteGround or Kinsta but all of MDD servers built with dual Xeon Quad Core processors and 24 GB of Ram to offer reliable and sustainable services. Their data center has redundant power supply, fire detection system, cooling and humidity controlling system, and multiple connectivity networks. You can pick from two shared hosting plans; Customizable and Professional. The first one allows 1~15 domains, 50 GB SSD space, 500 GB bandwidth, 25 databases and email accounts, Weebly site builder, cPanel, and free Let’s Encrypt. On the other hand, Professional allow everything unlimited which means you can host unlimited domains, create unlimited FTP/Email accounts, and all “Customizable” features. To make selection easier, select the “Basic” for new or small websites. Webmasters having more than one or high traffic sites should choose “Professional” plan. Both plans employ the same features except the allowed storage, number of databases, bandwidth, FTP accounts, and sub-domains, etc. If you’re using another company then MDD team will migrate it to their servers at no extra charges. Recently, they upgraded to a self-healing SSD storage area network to deliver 900% more execution per seconds and 1200% bandwidth enhancement to the platform. Customer support is provided by a ticket system and live chat which can be accessed 24/7/365. However, you can also call them for urgent assistance (regarding sales and billing) but there are fixed hours 8 AM ~ 4 PM Eastern Time Monday to Friday to get in touch via phone call. All shared hosting users get a 30 days refund policy. Why Do I recommend Annual Subscription? In web hosting industry, it is common to offer the biggest discount for new customers on their first billing. It helps companies to attract new clients by giving huge saving and freebies thus make more money. But when you choose to pay as you go or month to month payment system, companies do not include most freebies like free domain, free marketing credits, and much more. So, in that case, an annual subscription can be a tremendous cost saver. A top-level domain usually costs around $12/year but you get one free when paying for the whole year in advance. Marketing credits can be used to monetize your newly created site on Bing, Google Adwords, and Facebook, etc. to drive instant traffic. All these benefits lack in monthly plans, so I recommend a yearly plan for most of the users. If you’re super conscious about your investment, then select a web host that provides pro-rated refund along with standard refund policy like A2Hosting. The reasons to decide which one should you choose varies from user to use and there is not a most suitable answer to this question. Except, you figure out for which purpose you’re going to buy hosting, i.e. is it a short-term project or long term? Is it only for a single site or multiple, it influences the cost significantly? For a long term, you should choose annual plans to avoid high fees but if you’re obsessed with performance then pick reliable host like SiteGround – I am using it for last one and a half year and more than happy with their quality. For learning purpose or short project, selecting monthly billing structure would be a right choice and for this, I would recommend A2Hosting. They don’t charge any fees for account setup and give unlimited storage and bandwidth along with pro-rated refund policy. Users interested in getting a free domain name even for a month to month hosting can also consider checking FastComet and TMDHosting. Here keep in mind, FastComet charges a setup fee whereas TMDHosting doesn’t demand initial fees but still give a free domain with a money back guarantee. So, I think the second one is a total WIN-WIN. Now, it’s your turn to pick the appropriate hosting company for your next project. Please do share your experience and thoughts on monthly web hosting fee structure, do you think it’s better than annual plan? Which host you’re using/going to use? Don’t hesitate to share your thoughts by dropping a comment.